Not all biologic grafts are made the same. Biodesign is a platform technology behind numerous tissue-repair products that span multiple medical specialties. The biomaterial used for Otolaryngology Head and Neck Surgery (OHNS) products is small intestinal submucosa (SIS).SIS is a durable collagen material that is isolated from porcine intestine. When used for soft-tissue repair, SIS provides a scaffold for host cells. The OHNS division’s primary areas of focus for soft-tissue repair are sinonasal, otologic and dura. 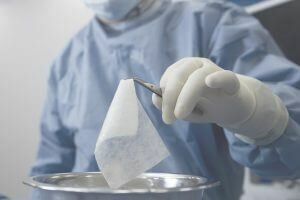 Often, physicians use a patient’s own tissue for OHNS procedures. Drawbacks to this approach include the time it takes to harvest patient tissue and additional incisions for the patient. Additionally, patient tissue can only be harvested from a donor site once. Pigs, on the other hand, are a readily available source for tissue extraction. The material from pigs has also been shown to be safe for medical devices with no known porcine transmissible spongiform encephalopathies (TSE). The submucosa within the small intestine also survives one of the harshest environments of the body and supports rapid cell turnover. What is an extracellular matrix (ECM)? The ECM is the structural substance that surrounds cells in nearly all tissues in the body. While the composition of the ECM varies by the type of tissue, it is generally composed of four major types of molecules.